A beautifully designed living room reflects the homeowner’s knack for elegance, and their conscious effort to represent his home gracefully to the guests. Most people are under the impression that redesigns require an enormous budget and a great sense of accessorizing, which can easily seem overwhelming, but they shouldn’t despair because there are many ways to express elegance without having to make hefty investments. An effective strategy is to utilize the natural architecture of your living room, i.e., its structural dimensions. Not every room is a perfect square or a rectangle – some rooms come in odd or irregular shapes – and this isn’t a disadvantage unless you want to see it as one. When decorating an irregular shaped living room, you can first use a variety of paint colors to give the room an artistic look, and you can even paint the walls in a way that visually transforms the shape of the room. Here are some 3 ideas to explore in order to strike a wonderful combination of solid wood furniture, large windows and draped curtains in your living room. Modern furniture is necessary to facilitate the comfort of residents and guests, to provide storage space, and also to elegantly fill the spaces in your rooms. Furniture types can be divided into two categories: commercial and handcrafted furniture. 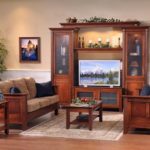 Commercial furniture by virtue of mass production is readily available in various stores, while, handcrafted furniture takes greater effort and time to produce. 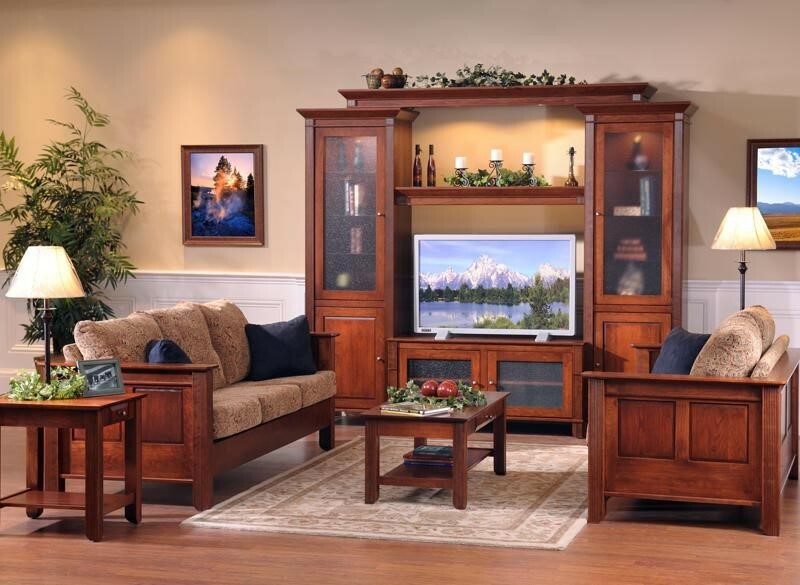 Handcrafted furniture also features distinct designs and has quite a few benefits over commercial furniture. One of the great benefit it offers is its own uniqueness as each piece is created with individual expertise and designed to reflect the artistry and passion of the crafter. Handcrafted furniture is also of a superior quality in terms of materials, often using top quality wood that can last for generations. Solid wood furniture is created using a variety of sustainable wood such as maple, cherry, pine and oak, with the most renowned companies offering rich combinations of these woods tailored to the desires of their customers. For the best design ideas featuring wood furniture remember to keep things relatively simple and modern – in other words, shop for quality rather than quantity. Toronto is a city of sunlight, snow and dramatic flora. Because of this, large windows allow residents to take in the surrounding nature and experience a refreshing amount of natural light. Large windows also compliment solid wood furniture by making the living room appear more spacious and lively, and accessorizing these windows with beautiful sheer curtains further enhances the beauty of the room. Large windows can flaunt glazed designs and also let in a lot of fresh breeze, not to mention the wonderful panoramic views a floor-to-ceiling window allows one to have. It lets you make the most of the nature or city your house overlooks. Draped curtains are beautifully flow-y, and sheer woven curtains bring coolness and softness to a room. They don’t block out the sunlight completely, but only dim it down, while at the same time allowing the room to remain lit. Curtains primarily protect one’s privacy from prying eyes, but they also tie together the elegance of the furniture, windows and any other accessories decorated in the room. Ever wonder why it’s called a “living room”? It’s because that’s where much of the “living” in your life is done, the entertaining, the chatting and the relaxing. Make your living room the focal point of your home with these three compelling design ideas. We are Violet and Anna, the brains behind Scotch Naturals. Although our focus is on beauty and makeup, we also blog about life and other excited aspects of it. We are pretty much into anything cute, and believe when you feel good about how you look, you spread that outwards into your life!